Pep Guardiola is confident he and Jose Mourinho will cross paths again soon after his old foe was sacked by Manchester United. 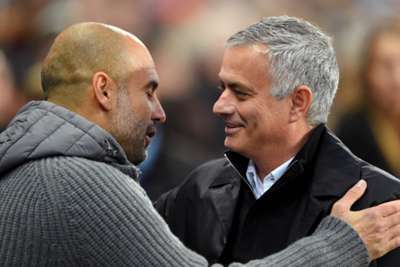 Manchester City boss Guardiola and Mourinho established a generation-defining rivalry during their time in opposition as coaches of Barcelona and Real Madrid. Barca memorably held the upper hand in their head-to-head battles in the 2010-11 campaign, with a 5-0 Clasico win at Camp Nou the highlight of a march to glory domestically, while a LaLiga and Champions League double was completed after a semi-final win over Madrid. Los Blancos lifted the Copa del Rey in 2011, however, and prevailed in another gruelling title battle the following season, after which Guardiola left Camp Nou for a year on sabbatical. Anticipation was high when the rivalry resumed in Manchester in 2016 but, after both underwhelmed in the first season in their new roles, the gulf between reigning Premier League champions City and United has been vast. Mourinho's side falling so far off the pace to set up his premature demise has led to suggestions in some quarters that time away from football might benefit the 55-year-old. But, speaking after his team's penalty shoot-out win at Leicester City in the EFL Cup quarter-finals, Guardiola insisted there should be no doubts over Mourinho's capacity to overcome this significant career setback. "When that happens, always I am sad for the mangers all the time," he told Sky Sports. "We are alone, the managers - when the situation is not good we are alone. "Always I am close to them. In football, that happens. "He doesn't need me, he is so strong. Soon he is going to come back and we will play again."